Stranger Things comes to life in new books — including a YA prequel — from the creepy world of Hawkins. Random House Children’s Books has announced three new titles set in the world of Netflix’s beloved series, Stranger Things. Stranger Things: Runaway Max is the first Young Adult novel to be published for the property. Written by New York Times bestselling author Brenna Yovanoff (The Replacement, Fiendish) Runaway Max is a gripping prequel that fills in Max’s backstory before she arrives in Hawkins, Indiana. Stranger Things: Runaway Max will be available on June 4, just a month before the highly-anticipated release of Stranger Things season 3. Also coming from Random House Children’s Books are two in-world collectable titles. 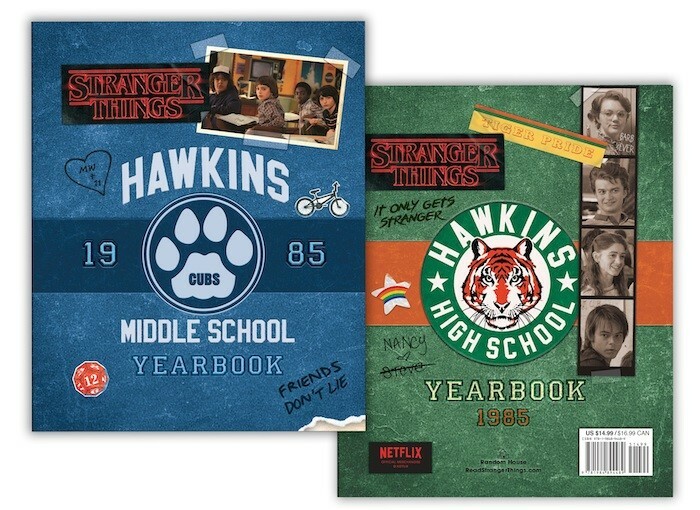 The Hawkins Middle School Yearbook / Hawkins High School Yearbook combines two yearbooks of the 1980s, offering insights into the characters, conventions, and daily lives of Hawkins. The book, full of pictures, inscriptions, and secret notes, hits bookstores on March 26. And Will Byers’s Secret Files will offer a new look into the mind of one of Stranger Things‘ most pivotal and ambiguous characters. Structured like a classic school binder, Will Byers’s Secret Files will explore the Upside Down through Will’s eyes. The book includes photos, sketches, notes about the Upside Down, and secrets from the Hawkins National Laboratory, giving readers a new angle on the mysteries of Stranger Things. Will Byers’s Secret Files will be released on Sept. 24. Well, one (stranger) thing is for sure. If the teasers for Stranger Things season 3 are any indication, these new books — like Hawkins, and like Steve’s hair — are going to be full of secrets. Stranger Things season 3 hits Netflix on July 4, 2019.